★廃液によって突然変異した泳ぎの得意な怪獣だ！ The advantage of this monster, mutated by waste, is swimming. ●武器＝15メートルもある右手のハサミで、大型船もまっ二つにしてしまう。Weapons = 15 meter sheers for hands, able to breaking large boats into two. ●特徴＝時速150キロで水中を泳ぐ。レッチ島の工場から出た廃液によって、突然変異したエビガニの怪獣だ。その甲らは厚く、ゴジラの放射火炎をはじいてしまう。Features = swimming at 150 kilometers. Its a crayfish monster mutated by waste water coming out from Lecci Island factory. It’s thick armor repels Godzilla’s atomic breath. 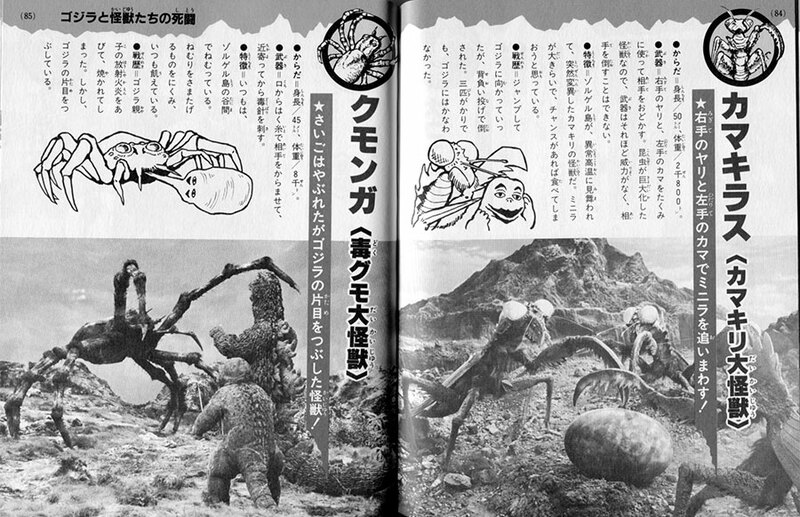 ●戦歴＝ゴジラに両手のハサミをもがれてしまい、負けてしまった。Combat Experience = Both scissor hands were plucked off by Godzilla in defeated. ★得意はくちばし攻撃！ Its advantage is a beak attack! ●からだ＝身長/15メートル、体重/20トン。Body = Length / 15 meters, Weight / 20,000 tons. ●武器＝マッハーのスピードで、急降下することができる。くちばし攻撃には、ゴジラも苦しんだ。Weapons = Able to dive at mach speed. It hurt Godzilla using it beak for attack. ●特徴＝とても気が強くて、なんでも敵にしてしまう。いつもは、レッチ島に住んでいる。エビラと同じように、巨大化した鳥の怪獣の一種だ。Features = Able to attack opponent anywhere in strong wind. Always lived on Lecci Island. Like Ebirah, it was transformed into a giant bird monster. ●戦歴＝ゴジラに、ただ一匹で挑戦したが、あっけなく負けてしまった。Combat Experience = Usually chalenged by small beasts, but not enough to avoid defeat against Godzilla. ●からだ＝身長/53メートル、体重/2万3千トン。Body = Height / 53 meters, Weight 23,000 tons. ●武器＝両手から出す、10万ボルトのしびれ電流と、緑色の皮膚から出す猛毒液。頭の角を使った、頭突き攻撃も得意だ。Weapons = 10,000 volts of numbing electric current coming from both hands and deadly poison coming from his green skin. His advantage is using the horn on his head for ramming. ●特徴＝ガマガエルの怪獣で、ミニラをいじめるのが大好きだ。自分の悪口をいうものがいると、大きな耳ですぐ聞きつけてやってくる。おこると、頭の角が赤く光る。Features = Life a toad monster he loves to tease Minya. ★右手のヤリと左手のカマでミニラを追いまわす！ A spear on the right hand and a sickle on the left to chase Minya! ●武器＝右手のヤリと、左手のカマをたくみに使って相手をおどかす。昆虫が巨大化した怪獣なので、武器はそれほど威力がなく、相手を倒すことはできない。Weapons = It uses its right hand spear and left hand sickle to threat its opponents. Because an insect has changed into a giant monster, its weapons have become stronger to that degree so that it is not able to defeat its enemies. ●特徴＝ゾルゲル島が、異常高温に見舞われて、突全変異したカマキリの怪獣。ミニラが大きらいで、チャンスがあれば食べてしまおうと思っている。Features = On Sol-gel island, all variations of the praying mantis monsters experienced abnormally high temperatures. As A growing Minya was a chance for them to eat. ●戦歴＝ジャンプしてゴジラに向かっていったが、背負い投げで倒された。三匹がかりでも、ゴジラにはかなわなかった。Combat Experience = Jumping on Godzilla to bring him down. Three were no match for Godzilla. ★さいごはやぶれたがゴジラの片目をつぶした怪獣！ At the last moment of defeat, this monster struck Godzilla’s eye! ●からだ＝身長/45メートル、体重/8千トン。Body = Height / 45 meters, Weight 80,000 tons. ●武器＝口からはく糸で相手をからませて、近寄ってから毒針を刺す。Weapons = It entwines its opponents with thread from its mouth, it thrusts its poisonous needle when it draws near. ●特徴＝いつもは、ゾルゲル島の谷間でねむっている。ねむりをさまたげるものをにくみ、いつも飢えている。Features = It always sleeps in Sol-gel Island valley. It hates to those who disturb its sleep and it’s always hungry. ●戦歴＝ゴジラ親子の放射火炎をあびて、焼かれてしまった。しかし、ゴジラの片目をつぶしている。Combat Experience = It is burnt up when covered in Godzilla’s son atomic breath. But, it damaged Godzilla’s eye. ★どう猛な肉食性怪獣！ A ferocious carnivorous monster! ●からだ＝身長/ 25メートル、体重/　250トン。 Body = Height / 25 meters, Weight / 250 tons. ●武器＝ジャンプ力があり、相手に体当たりするが、なんといっても、熱戦をはくのが必殺武器だ。Weapons = Jumping kicking his opponent, after all is said and done, is his deadly weapon in a fierce fight. ●特徴＝どう猛な肉食性怪獣だ。太陽光線には弱く、昼間はほとんど戦わない。Features = Ferocious carnivorous monster. He does not fight well during the day being weak in the sunlight. ●戦歴＝ゴジラたちといっしょに、キラアク星人やキングギドラと戦った。Combat Experience = Fought the Kilaaks and King Ghidorah alongside Godzilla and others. ★海中撃が得意わざ！ Its skillful ea attack is his advantage! ●からだ＝身長/ 150メートル、体重/ 3万トン。Body = Height / 150 meters, Weight / 30,000 tons. ●武器＝長いからだで、相手に巻きついてしまう。アゴの力が強く、かみついてとどめを刺す。Weapons = He can wrap up his opponents with his long body. He pierces to bite and snap with a strong powerful jaw. ●特徴＝海の中での攻撃は得意だが、地上での動きは少しのろい。Features = His strength is underwater attacks but limited mobility on land. 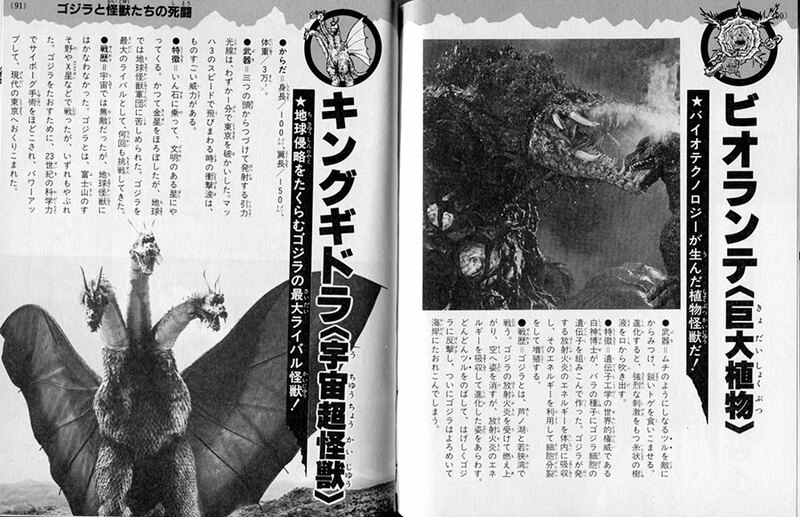 ●戦歴＝ゴジラといっしょに、キラアク星人やキングギドラと戦った。Combat Experience = Fought the Kilaaks and King Ghidorah alongside Godzilla and others. ★水陸空の万能怪獣！A skillful water, land, and air monster! ●からだ＝身長 / 50メートル、体重 / 1万5千トン。Body = Height / 50 meters, Weight / 15,000 tons. ●武器＝背中に一列にはえているトゲに、猛毒を持っていて、相手を刺す。Weapons = He pierces his opponent with spines growing up along his back, holding deadly poison. ●特徴＝億年前の生物であるバラノポーダの生き残りだ。手足の間に薄い膜があり、これを使ってマッハー•5のスピードで空を飛び、水にもぐる。Features = A survivor of hundred million years old living creatures Baranopoda. There is a thin membrane between his hands and feet. He uses mach 5 speed flying in the sky and in the water. 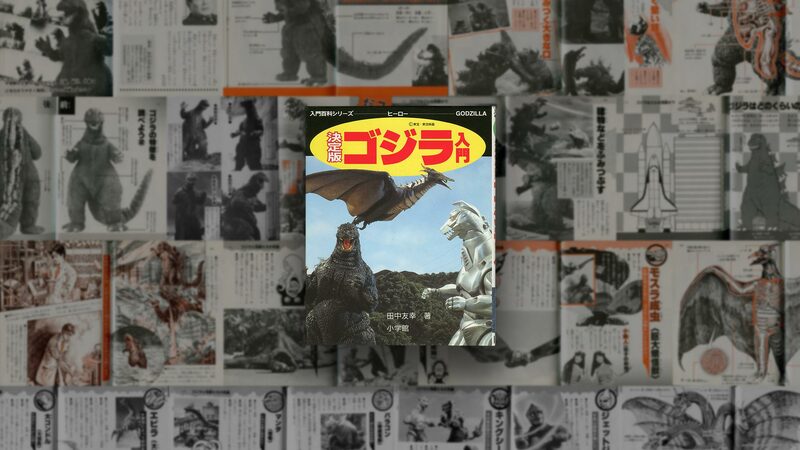 ●戦歴＝ゴジラと力を合わせて、キラアク星人やキングギドラと戦った。Combat Experience = He joins forces with Godzilla to the Kilaaks and King Ghidorah alongside Godzilla and others. 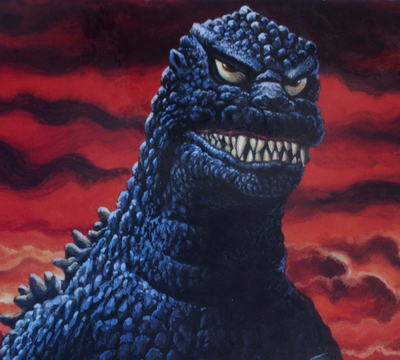 ★両親回路が働いて、巨大化したゴジラの味方だ！ With active conscious circuitry, he becomes big and is an ally of Godzilla! ●からだ＝身長/2メートル~50メートル、体重/15トン。Body = Height / 2 ~ 50 meters, Weight / 15 tons. ●武器＝両目のサーチライトで目つぶし戦法をとり、チョップで相手をたたきつける。Weapons = When blinded his eyes become searchlights and he strikes his opponent with a chop. ●特徴＝良心回路が働いて巨大化する。マッハ3•5のスピードで飛行し、そのままプランチャー攻撃に入る。Features = His has conscious circuitry and he changes his size. Flying at mach 3-5 he comes with a Plancha attack. 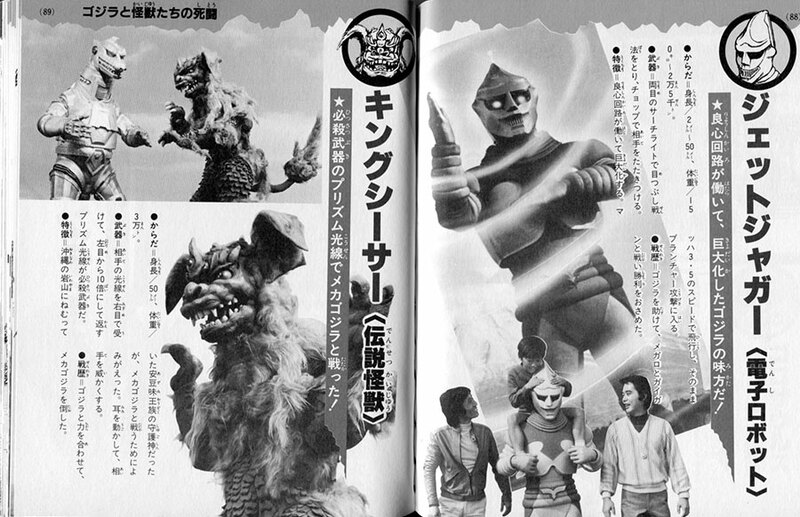 ●戦歴＝ゴジラを助けて、メガロとガイガンと戦い勝利をおさめた。Combat Experience = Helped by Godzilla he subdues Megalon and Gigan in a victorious battle. ★必殺武器のプリズム光線でメカゴジラと戦った！He battles MechaGodzilla with his death weapon plasma beam. ●からだ＝身長/50メートル、体重/3万トン。Body = Height / 50 meters, Weight / 30,000 tons. ●武器＝相手の光線を右目で受けて、左目から10倍にして返すプリズム光線が必殺武器だ。Weapons = His weapons include a light beam from his right eye and a left eye that returns a plasma beam 10x stronger. ●特徴＝沖縄の岩山にねむっていた安豆味王族の守護神だったが、メカゴジラと戦ったによみがえった。耳を動かして、相手を威かくする。Features = Awakened from a rocky mountain in Okinawa, the guardian deity of the Azumi Royal Family rises to fight MechaGodzilla. His eyes shift and he intimidates his opponent. 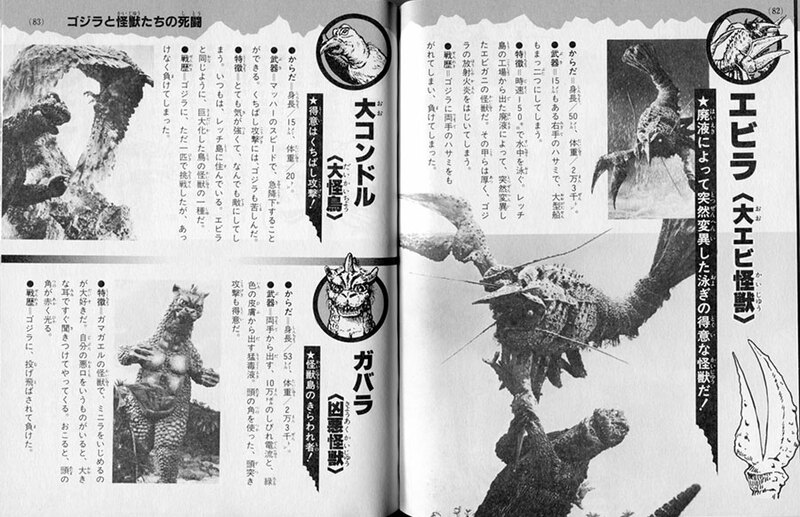 ●戦歴＝ゴジラと力を合わせて、メカゴジラと倒した。Combat Experience = Together with Godzilla, they take down MechaGodzilla. ★バイオテクノロジーが生んだ植物怪獣だ！ Biotechnology gives birth to a vegetation monster! ●武器＝ムチのようにしなるツルを敵にからみつけ、鋭いトゲを食いこませる。進化すると、強烈な刺激をもつ糸状の樹液を口から吹き出す。Weapons = wrapping his tentacles around opponents like a whip, sharp eating spines. When evolved it spews strong sappy spit with a strong stimulus from its mouth. ●特徴＝遺伝子工学の世界的権威である白神博士が、バラの種子にゴジラ細胞の遺伝子を組みこんで作った。ゴジラが発する放射火炎のエネルギーを体内に吸収し、そのエネルギーを利用して細胞分裂をして増殖する。Features = World-renowned genetic engineering authority Dr. Shiragami crosses the genes of Godzilla cells with a rose. 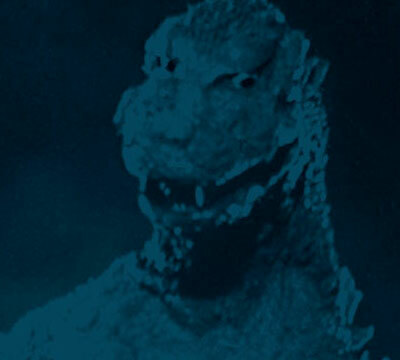 It absorbed the energy of Godzilla’s radiation breath using this energy for cell division and multiplication. ●戦歴＝ゴジラとは、芦ノ湖と若狭湾で戦う。ゴジラの放射火炎を受けて燃え上り、空へ姿を消すが、放射火炎のエネルギーを吸収して進化した姿をあらわす。どんどんツルをのばして、はげしくゴジラに反撃し、ついにゴジラはよろめいて海岸にたおれこんでしまう。Combat Experience = He fights Godzilla in Lake Ashi and Wakasa Bay. He is burned by Godzilla’s atomic breath and disappears into the air. Absorbing the radiation flame energy his appearance changes. His tentacles rapidly approach with a violent counteract against Godzilla. Finally Godzilla staggers on to the shore and collapses. 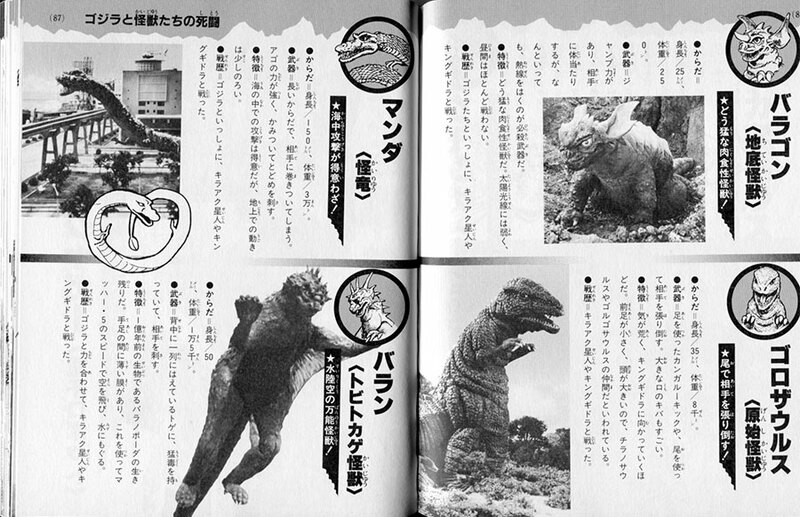 ★地球侵略をたくらむゴジラの最大ライバル怪獣！Godzilla’s greatest monster rival planning on invading the earth! ●からだ＝身長/100メートル、翼長/150メートル、体重/3万トン。Body = Height / 100 meters, Wing Span / 150 meters, Weight / 30,000 tons. ●武器＝三つの頭からつづけて発射する引力光線は、わずか1分で東京を破かいした。マッハ3のスピードで飛びわる時の衝撃波は、ものすごい威力がある。Weapons = Emits a continuous gravitation beam from its three heads to destroy Tokyo in one minute. The shock ware from flying at mach 3 has earth-shattering power. ●特徴＝いん石に乗って、文明のある星にやってくる。かつて金星をほろぼしたが、地球では地球怪獣軍団に苦しめられた。ゴジラを最大のライバルとして、何回も挑戦してきた。Features = Aboard a meteorite it comes to a civilization on a star. Having destroyed Venus, it inflicts pain on earth with the group of monsters on earth. ●戦歴＝宇宙では無敵だったが、地球怪獣にはかなわなかった。ゴジラとは、富士山のすそ野やX星などで戦ったが、いずれもやぶれた。ゴジラをたおすために、23世紀の科学力でサイボーグ手術をほどこされ、パワーアップして、現代の東京へおくりこまれた。Combat Experience = Unrivaled in space, it is no match for the monsters of earth. 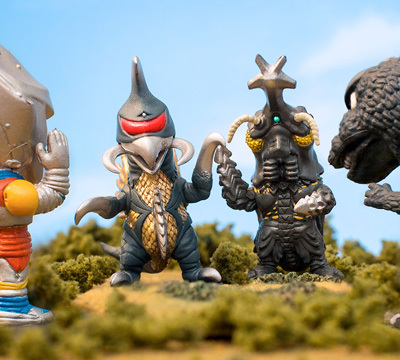 It battled on both the plains of Mt Fuji and on Planet X against Godzilla. It is sent to modern-day Tokyo defeat Godzilla, but after it is subjected to a cyborg surgery with the power of twenty-third century science to make it more powerful.